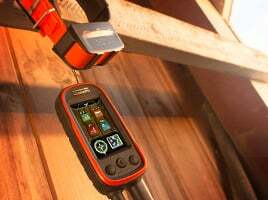 With multiple Alpha 100 handhelds and TT15 or TT15 mini dog devices, pinpoint up to 20 dogs or hunters’ exact positions on a large, glove-friendly touchscreen display even when they are out of sight. Because Alpha 100 comes preloaded with TOPO U.S. 100K maps, you’ll always know your surroundings. Measure each dog’s speed, distance and the direction being traveled. Plus, receive notifications when a dog is “Treed” or “On Point.” A single Alpha 100 can track up to 20 dogs or fellow hunters by receiving signals from additional Alpha 100 handhelds, TT 15 and TT 15 mini dog devices (each sold separately). Or, choose tracking only with the new T5 or T5 min dog devices. For competitions that don’t allow stimulation, tone or vibe, the compatible T 5 or T 5 mini tracking devices are an excellent alternative. And, if you’re using a vehicle to follow and retrieve your dogs, the Garmin DriveTrack70 dog tracker and GPS navigator (sold separately) provides an easy-to-watch “big picture” solution. The 7-inch moving map display shows dog positions overlaid on TOPO contours or satellite image views – along with navigation cues that help point you to your dog’s current location. This package will be shipped insured and require a signature upon delivery. If you will not be available to sign for the package, please call our office to make other delivery arrangements at 518-863-8721. Exclusive BirdsEye Satellite Imagery and 1:24K scale TOPO mapping.